This practice harnesses the affordances of the Popplet application to relaunch a storytelling writing task within TCD's institution-wide language programme. In the former version of this task, learners were asked to rewrite a story in their own words, by simply brainstorming, drafting and typing up a document. This practice uses the features of Popplet which allow visualisation, mind mapping and also collaborative project work to present a flowing and attractive narrative for readers, supported by images and drawings as well as text in a variety of colours, sizes and forms. This project asks students to select and retell a famous English story from any genre, e.g. a fairy story, a children’s tale, a play, or piece of science fiction. Students are assessed on their spoken productive using a holistic rating scale, and are also expected to include a structured list (or Popple) of new vocabulary in their Popplet. The story can be as long as students like, but it must not shorter than 300 words, organised into different Popples within the Popplet. Students are encouraged to use as wide a range of grammatical structures and vocabulary items, especially new terms and items that are specific to the genre they have selected. The attached Popplet explains the task to students. Carson, Lorna. (2018). 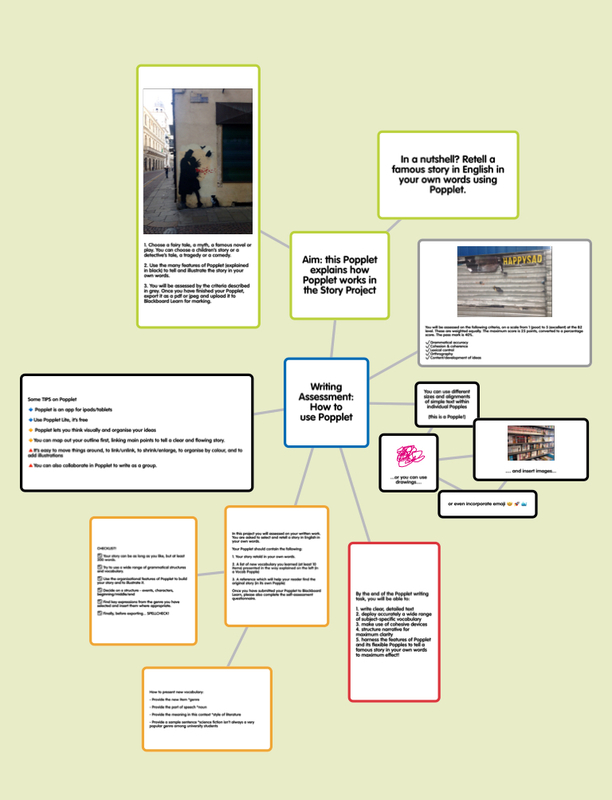 "Assessing written production using Popplet". En línea: https://foco.usal.es/fichas/assessing-written-production-using-popplet/. Repositorio FOCO [21-04-2019].